I am a huge fan of canvas shoes. I feel like they’re more breathable than a lot of other shoes, and when they get dirty, I can toss them in the wash. Not only that, but they come in such great colors and super fun patterns, that you can totally have fun with your shoes, and not worry about them. One of the great things is that canvas shoes are so super cute for summer, but really transition well to fall, too. Here are a few of our favorites to help make that transition super smooth. Links may be affiliate links. They help support the site at no additional costs to you. 1 Sequined Converse Sneakers ($120) – Okay, these are my new favorite shoes. Like, for real for real. This Etsy seller is making sequinned and glittered Converse in a myriad of styles and colors. Shown are the rainbow low tops with gold glitter toes. WANT! 2 Converse Chuck Taylor OX Low Canvas Sneakers – These are the classics, and in just about every color you can imagine. If you don’t have a pair or two of these in your closet, you should remedy that. 3 Kate Spade New York x Keds Polkadot Sneakers ($78) – How great are these? Polkadot keds with just the right amount of metallic accents. Designed by Kate Spade, of course. LOVE! 4 Soludas Cactus Espadrilles ($75) – We all have that friend that is obsessed with cactus and succulents. Show them these amazing espadrilles. 5 Tory Burch Castaway Canvas Flats ($195) – So tropicale! A leather palm tree and a pineapple adorn these flat canvas espadrilles. 6 Bobs by Skechers Flamingo Fest ($45) – Flamingoes? Say what? OMG, so fun! Check out our Dog + Cat shoes too, for more of the same kind of aesthetic. 7 Vans Ward Hi Canvas Skate Shoes ($65) – Growing up in SoCal, you basically live in Vans. They’re an authentic skate & surf brand, and the shoes are so comfy. Available in 6 shades, shown in Red. 8 Dr Martens Darcy Floral 8 Eye Boot ($120) – The same great style as classic Doc Martens in great floral canvas print. Perfect for those that want something a little girly. 9 Keds Triple Metallic Canvas Sneakers ($30) – I love keds, and I love some shimmer. These are perfect for me! 10 Toms Dip Dye Classic ($55) – I love a good ombre look, and these are so on trend. Super cute, but still totally neutral. 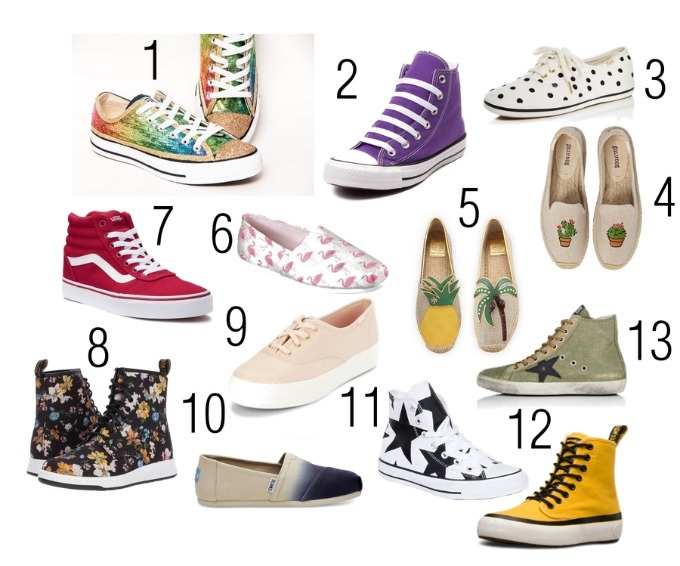 11 Converse Chuck Taylor Star Print Sneakers – How sweet are these? I would wear these ALL THE TIME! They don’t appear to be available in the US, but if you find somewhere that does have them, let me know! 12 Dr Martens Canvas Monet Boots ($75) – I adore Docs, and have several pairs. These Monet style are a cross between classic docs and high tops. Available in 6 fab colors, too. 13 Golden Goose Canvas and Suede Sneakers ($480) – I am totally digging the lived in look of these. Pair that with the suede stars and I’m a little in love.